Communication is so important in relationships. When relationships break up or don’t go well, it is often due to a communication breakdown. We communicate in many different ways but today I am going to talk about verbal communication. Verbal communication involves speaking and listening. We hear a lot about being honest, speaking your truth and fully expressing yourself and I agree 100%. What we don’t hear as much about is listening. The first concept about listening that really changed listening for me is “listen with the intent to understand instead of trying to be understood”. Listen like you really want to get what the other person is experiencing. Really be curious and interested in understanding them at a deeper level. It really is about receiving another person. Give them the gift of being heard and wanting to understand them. We all want to be seen and heard. And while I don’t believe we can completely understand another person and their experience because we aren’t them, we can listen to try and understand the best that we can. Just the intention of doing so is a big gift. To be clear, this isn’t about agreeing with someone. It is about trying to see another’s perspective. This takes us away from truly listening. It diverts our attention to thinking about a response instead of receiving the other person. Another thing we tend to do is get caught up in being understood and getting our point across so we often interrupt them. I am fortunate (although it doesn’t feel like it at times:)) to live with a husband and 2 daughters who are my biggest teachers. If my daughter is talking and I can see that she is getting more and more worked up, I interrupt her in attempts to avoid a melt down. This is all about my own self-preservation because I don’t want to have to deal with the melt down. Yep, she is right. I am not listening to her, just trying to avoid being with her heightened emotions. 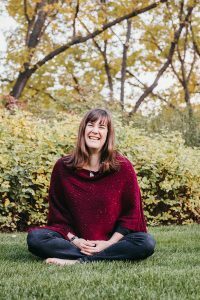 Years ago at a WarriorSage Illumination Intensive Retreat, I learned a process that has been so helpful in deepening my listening skills. It is called a dyad. A dyad is a communication between 2 people. One person is speaking and the other is listening. It isn’t a conversation. The listening partner only says “thank you”. There are other guidelines as well but that is the simplification of it. I love this process because when I am speaking, I know I am not going to receive advice or the opinion of my partner. It is an opportunity for me to speak my truth and be heard. I also love being the listening partner because my only focus is to listen to and receive my partner and say thank you. You can arrange this with someone in your life as an actual process or just begin to listen and have your only response be “thank you” unless you are asked for your perspective. I invite you to give it a try and see what you think. The second concept that was a game changer for me in the realm of listening is also from an Illumination Intensive. We were having lunch and we were asked to only speak about ourselves and our process. A staff member sat at each table. What the staff member said has stuck with me ever since. He said “since we are all from God/Universe/Source (GUS) and of GUS, then anyone speaking to you is GUS speaking to you”. For the rest of the retreat, I listened differently. Instead of being caught up in my own stuff, I listened as if I was being given a message. I was fully present and receiving the person sitting across from me. In doing so, I received so many gems of wisdom. Since everything is for me (and you), then everyone I meet and what they say to me is for me in some way. If I am not present and truly listening, I will miss out. By being really present and listening with the intent to understand, we are giving the gift of receiving someone and in that receiving, we are being given to at the same time. It’s a beautiful full circle. For some people, relationships with family members can be triggering and not so enjoyable. This is partly due to core wounding experiences we had as children and partly due to the protective patterns we have adopted in attempts to stay safe and loved. This video will discuss these points in more depth and what to do to navigate these relationships with more ease and enjoyment. Every January, I like to choose a word or a theme for the upcoming year. Sometimes the word comes to me right away and sometimes it takes some contemplation. I have even changed it a few times and allowed my journey forward to choose it for me. This year, my word is soften. It’s not a commonly chosen word like abundance, love, success etc. but it means a lot to me. 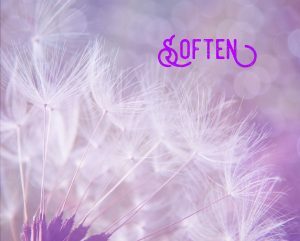 I chose soften because it is what I desire to do more of and it acts as a reminder. 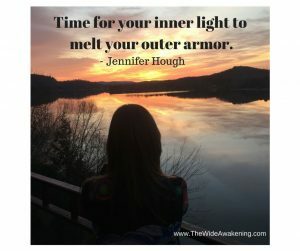 When I am in survival mode, engaging in my protective mechanisms trying to stay safe and not get hurt, it is like I put protective armour on and there is a rigidity to me. It shows up in my body as tension in my muscles (and pain) and in my mind as seriousness and rigidity in my thinking (tunnel vision). I am in fear and fight or flight. Soften reminds me to shift from survival mode into thriving. It reminds me to breathe. It reminds me to drop out of my head and into my heart. It reminds me to let go of the seriousness and to enjoy myself and play instead. It reminds me to accept what is and allow myself to be given to. One of the things people often don’t realize is that when you pick a word, not only will you be shown where you are that or you have that, you will also be shown where you are not being that. In my case, I will be shown the places where I am softening and allowing myself to soften AND I will also be shown the places I am being asked to soften more. So do be careful with what you ask for because you will be given it! We are not even 2 weeks into the year and I have already been shown where I was being rigid and softening was being asked of me. 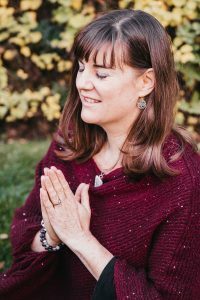 I got the memo pretty quickly so I didn’t stay in suckville very long and I am very grateful for the wisdom I gained by asking my higher levels and the universe for help, by slowing down and paying attention to what showed up and then for taking the steps that helped me soften. It was proof that we are constantly being supported and we just need to be aware and ask for help. I invite you to contemplate what you desire more of in choosing your word for this year, realizing that you may be asked to make changes in order to receive it. I held my monthly activation circle this morning. Starting a few days before each circle, the energies begin to gather and move and I feel the effects of them. Yesterday, I began feeling very vulnerable and shed some tears as the energies moved through me. I knew this circle was going to be about completing cycles before the end of 2018 and my body and heart were beginning to release what isn’t in alignment. It wasn’t just this circle that was affecting me energetically. It was the fact that we are about to be complete with this year as we move into 2019. December in general is a month of endings, not of creating new so trying to begin a new cycle in December goes against the universal flow of energy and will be met with some resistance. I love new beginnings but will admit I have a harder time with completions of cycles. Because of that, I have a tendency to jump into the new without fully completing the old cycles because they have lost their sparkle. Who wants to stick around with the old of 2018 when the shiny newness of 2019 is waiting to begin? The problem with not completing cycles though, is that we will take with us what isn’t completed into the new cycle. It’s like we carry the baggage of what has been left undone and that muddies and dilutes the energy we bring to our new endeavours. So as much as I prefer not to, I am in contemplation mode of what is yet to be completed. What has been left unsaid? What has been left undone? Where is there dissonance or discord? What feels out of alignment for me? A clue to what these uncompleted things may be is that they have likely been in your face this past month of December. That’s what tends to happen as we approach the ending of a year. We are literally being assisted by the universe in seeing what has not been finished, forgiven, let go of, shifted and transmuted. It knows these things that are not aligned with the trajectory we are on based on what we asked for and it is assisting us by showing us, in a not so subtle way, what still needs to be addressed. It is the time, as uncomfortable is it may be, to make the changes that will bring your life into more alignment. So I invite you to take a moment to relax and sit and look at what is being asked for you to become aware of and is acting as a catalyst for change. What has been up for you this past year? What pattern, limiting belief, stuck emotion, perspective, protective habits, inauthentic ways of being have been coming into your awareness and are up to leave? Ask what steps need to be taken in order for the change to occur. The key is to act on these steps as inaction will just cause more dis-ease in your system. So even though looking at this stuff isn’t always comfortable, it will become even more uncomfortable to not look at it and carry the heaviness with you into 2019. Then we can move forward into 2019 with more of the fullness of who we are, more from our Souls’ Essence instead of what isn’t us. And that is when magic happens! Happy New Year! Happy 2019! May it be the year you embrace your essence, live your truth and love your life!!!!!! I was inspired to create a video series on a topic that comes up with just about every client – relationships. This first video will address what I believe is the most important relationship there is… with yourself. Why do I believe it is the most important relationship? It’s because the common denominator in every relationship you have, be it with family members, friends, colleagues, or clients, is you. So if you desire to improve your relationships with people in your life, it’s important that you start with yourself. Watch below to learn more about this top priority relationship. Be sure to join me for the next video where I will be discussing relationships with family members – parents, siblings, children etc. You can sign up for my newsletter and/or subscribe to my YouTube channel by clicking here. Saturday was my 49th birthday. As I embark on this 50th year of living this lifetime in this body, I decided to pull an oracle card because that’s how I roll. Quan Yin is one of my gals so I turned to her for some guidance with my Kuan Yin Oracle cards by Alana Fairchild. I asked for the message that will inspire me forward this year, the message that I can return to over and over again when I can’t see the sun for the clouds. 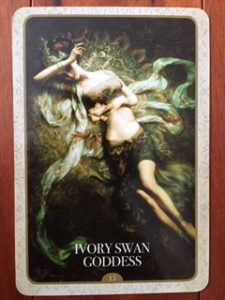 I pulled the Ivory Swan Goddess card. And because we are all microcosms of the macrocosm living in a fractal universe, this message is for you as well. This resonated deeply with me especially in relation to my last post when I wrote about shame. The timing is also perfect as we stepped through the 11:11:11 portal on Nov.11, 2018. This portal is one of shedding the shame, the condemnation, the self-criticism and judgement, our egoic patterns of protection and allowing ourselves to open to receive the love, grace and abundance that we desire and is our natural birthright. It is a time to step out of the illusion of who we thought we were and come home to the truth of who we are. We can choose what we focus on, where we source from. We can choose to let love make our choices for us or to let fear by the driving force. For me, this message is a reminder to not only accept and love the truth of who I am, my divine light, but to honour and revere it, to treat it as sacred. It is remembering that the sun is always there, even when it is covered by the clouds and we can’t see or feel it. It is remembering that no matter what struggle or suffering we may be experiencing, our soul, our divine light is ever present and we can source from it in every moment. So my birthday wish for everyone, myself included, is that we believe in the purity and beauty of the truth of who we are instead of the illusion of not-enoughness and unworthiness. It is time to revere the divine energy within us with unconditional love and self-acceptance. And it’s time to see it in each other. Let’s let love win and shift the planet while we’re at it! Shame. It’s pervasive. It’s in the collective and is coming up to leave. I’ve been dancing with this emotion myself the last couple of weeks. Shame is not something people like to talk about. Why? Because it is uncomfortable and doesn’t feel good. We’ve all had moments when we’ve felt shame and we do our darndest not to be with it. Shame is the densest, lowest vibrational frequency emotion there is. Carrying shame within us gets in the way of us being able to feel joy to the extent that we are capable of. While guilt is about “I did something bad”, shame is “I am bad”. It is very linked to believing that you aren’t enough, that something is inherently wrong with you. We have all been shamed and we have been the ones doing the shaming. It is a learned behaviour, one that we learned as kids. Parents, teachers, employers etc. have used shaming for years as a way to get someone to behave the way they want them to. We do it unconsciously. It is what we have learned. It is an egoic protective mechanism to keep us feeling in control and safe. Talking about and shining a light on shame brings it into our awareness so that we have choice. We have choice about what we do when we feel shame. Last week, shame was surfacing for me big time. There were places I knew I was carrying shame and places that I had no idea shame existed. It was coming up to leave. I let myself be with it, let myself feel it, as uncomfortable as it was. And instead of letting that emotion take me out, believing that there was something wrong with me, I forgave myself each time it surfaced and loved myself instead. I loved myself at all ages from being a little girl up to now. All those times I blamed myself for not “getting it right”. All those times I blamed or shamed someone else. I forgave it all and felt love and compassion for myself. Instead of believing that there is something wrong with me, I remembered the truth that I am a whole and complete being. We all are. I have come out the other side and I feel different. I feel lighter and that voice that beats myself up is not speaking right now. There is no need to shame anyone, ever. It is time that we un-learn shaming and replace it with letting love win instead. It is time. New, higher vibrational frequencies are coming through to this planet right now. We are being upgraded which means that the low vibrational emotions that we are carrying are coming into our awareness, hence the shame surfacing. If we allow ourselves to feel them, let them move through us and don’t engage with them, they will leave us, expanding our capacity to be with more of the higher frequency emotions such as joy, love and gratitude.